Business Analyst (certification) Online Weekdays training program. 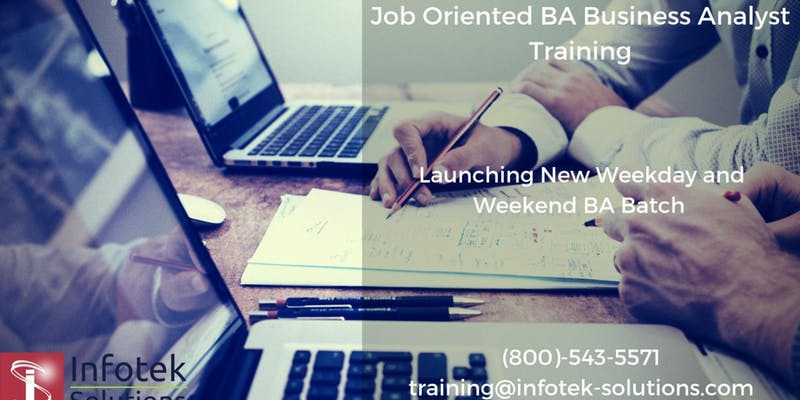 Business Analyst (BA) Online Weekend training program. The Infotek Solutions Inc. Business Analyst (BA) course is a course dealing with task of understanding business change needs, assessing the business impact of those changes, capturing, analyzing and documenting requirements and supporting the communication and delivery of requirements with relevant stakeholders. The goal of this course program is to provide you an intensive training & mentor you to be a successful BA for IT market. This course will include Roles of Business Analyst, Stakeholders & Project Managers, Requirements etc. The course utilizes a blended virtual/online approach of training. The content is fully web-based. Trainers utilize tools and resources provided by Infotek Solutions Inc to leverage time in the virtual classroom and give focused 1-on-1 attention to trainee or candidate. Each unit of the course is broken down into lessons. Lessons consist of video tutorials, short quizzes, adding up to over 100 hours of hands-on practice in total. Each unit ends with a comprehensive unit test that assesses trainee’s knowledge about the material from that unit. You will get the knowledge of roles of BA, what problem they address and what are the values of BA. You will get the knowledge and working with Stakeholders and Project Managers. You will get the knowledge of Life Cycles overview like SDLC, STLC etc. You will get the knowledge of Requirement Initiative Forming Requirements. You will get the knowledge of Transforming Requirements. You will get the hands-on experience in building requirements for projects, project managing tool like JIRA etc. 24*7 remote accesses to courses, projects, quizzes, test papers, BA forums and various web related skills.